The American College of Rheumatology publications are dedicated to presenting articles of interest to researchers, physicians, and health professionals involved in healing, preventing, and curing arthritis and related disorders of the joints, muscles, and bones. The American College of Rheumatology publications Arthritis & Rheumatism, Arthritis Care & Research, and The Rheumatologist, bring you content wherever you are, whenever you want it. 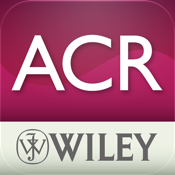 Download the ACR publications app for your mobile device and access instant, real-time updates including article abstracts, upcoming events, news, and other free content. You can create a reading list tailored to your own interests as well as tag select content for convenient sharing with your friends and colleagues through email, Twitter, Facebook, and more!